I have been writing a lot lately about the amazing success of the Geneva Spring Auction season record-breaking results. The biggest news of all, was likely the Rolex Moonphase that sold for $5 Million, and this model is very similar in many ways. Not only does it share the same look and Rolex Reference Number of 6062, but both Rolex Moonphase models were auctioned by Phillips. On April 29, 2017, I wrote an article about this model, which included the superb wrist shot from Hodinkee that shows this amazing watch on Cara Barrett's wrist. Methinks the $5 Million Rolex sale stole the thunder from this amazing watch. I mean, think about it for a second. 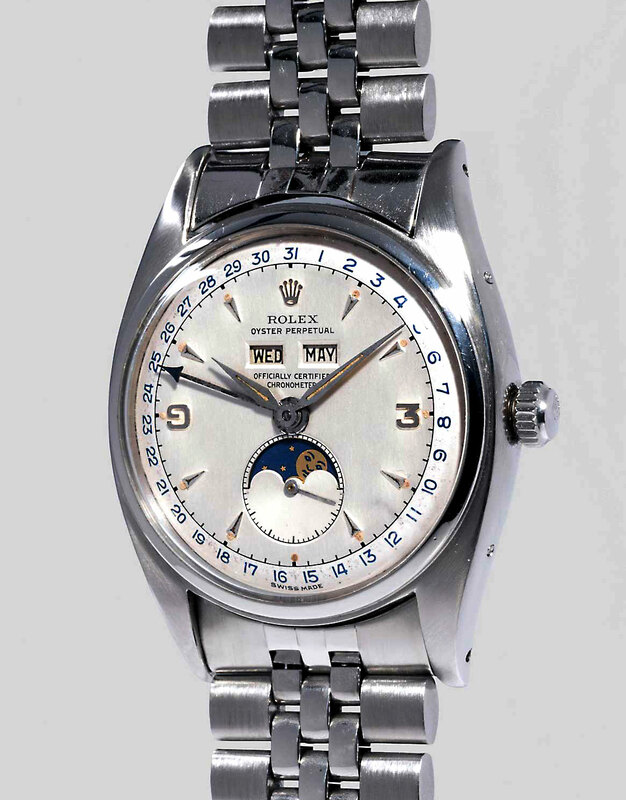 A Stainless steel Rolex that probably retailed for around $100 in 1953, just sold for $2 Million!?!! That is crazy profound. Few watches can cause fervor and excitement among collectors like the mythical reference 6062 and 8171. While Rolex is particularly known for its sports models, such as the Submariner or even Daytona, the manufacture has created some of the most sublime triple calendar wristwatches in the world. 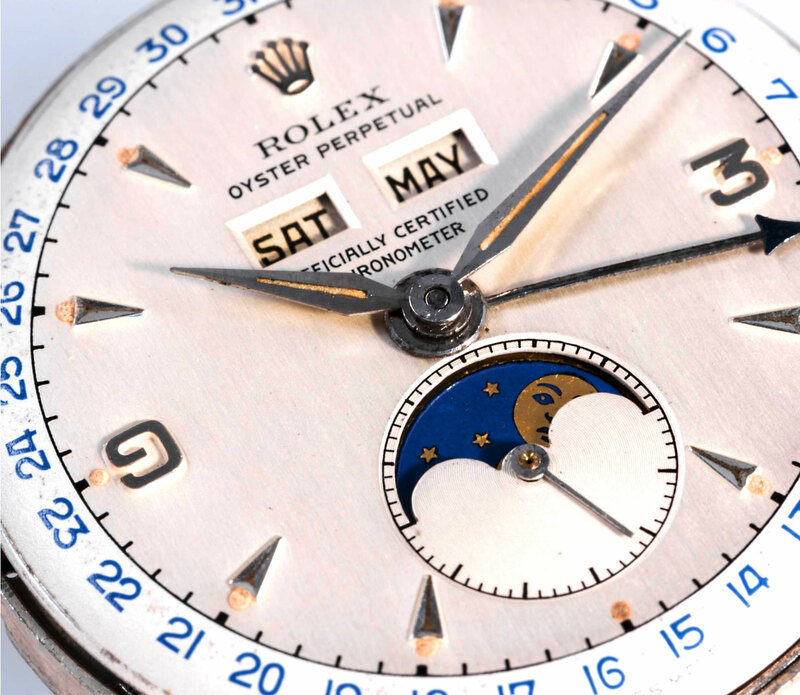 Rolex has only ever produced two references that feature a triple calendar complication with moonphases. While the present watch, reference 6062 features a screw down Oyster case back, its sibling reference 8171 is fitted with a snap-on case back. Launched at the Basel fair in 1950, reference 6062 was the first automatic wristwatch with date and moonphases that was housed in a waterproof case. Cased in stainless steel, yellow gold and pink gold, the model was fitted with a number of dial variations. Among the most exclusive and desirable versions are ones cased in stainless steel, with no more than two dozen examples having survived in different conditions, surfacing on the market thus far. We are delighted to present this reference 6062, which has remained in excellent and unrestored condition. The most impressive stainless steel reference 6062 to appear in the public space in recent years, it presents an opportunity to satiate even the most demanding of collectors and watch scholars. Featuring Arabic numerals at 3 and 9 o'clock, it features a lacquered silvered finish in the main portion of the dial, along with a ivory grené outer ring, providing great contrast and depth to the watch. The angled date and day apertures demonstrate the dial's originality, along with the sharp track where the moonphase aperture meets the rim of the subsidiary dial. The luminous material is placed exactly where it should be - precisely outside the silver-colored facetted relief hour markers and next to the Arabic numerals, reflecting Rolex's extremely stringent standards in quality. The outer date ring, too, is correct. The printing displays an inky blue hue which one would expect on an original example. The font is correct, with characteristic "open 6 and 9s". Considering the watch is over sixty years of age, it is remarkable that the dial has not been spotted or tarnished. This example remains free of noticeable imperfections in part to its waterproof Oyster case that still bears "Modele Depose" and "Registered Design" on the case back, interspersed with a curved rectangular design. This dial, coupled with a stainless steel case, makers for a particularly impressive combination, really embodying the characteristics of a most classic iteration of reference 6062 cased in stainless steel. 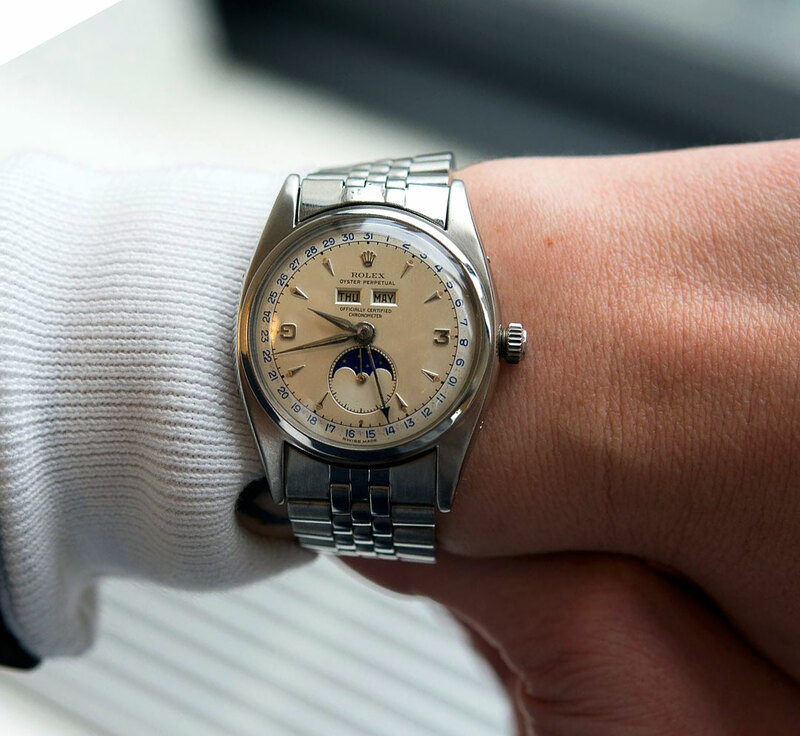 During the period, stainless steel wristwatches were often bought for everyday wear. The fact is even more pertinent as stainless steel examples retailed for much less than their yellow gold counterparts, hence at the time, considered not as "valuable". Consequently, many surviving examples are not preserved in their original form, and heavily polished or corroded due to their function as a "tool watch". Barely a handful today exist is original condition, and often break world records when they do appear on the market. Examples like the present watch, with its full proportions and facets are completely phenomenal. The present watch is furthermore proudly, and prominently illustrated in John Goldberger's book 100 Superlative Rolex Watches on pages 138 and 139. Every detail of the watch is carefully and painstakingly photographed to showcase its beauty.